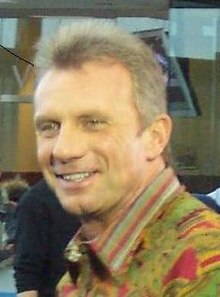 Joe Montana in his later years at an ESPN set. Joseph Clifford Montana, Jr. (born June 11, 1956) is a retired American Hall of Fame football player. He played as a quarterback for the San Francisco 49ers and the Kansas City Chiefs of the National Football League. With the San Francisco 49ers, he won four Super Bowls. He was named the Super Bowl Most Valuable Player (MVP) three times. Montana began his career playing for the University of Notre Dame in Indiana. He broke many records while playing for San Francisco. His main receiver was Jerry Rice, who is also in the Hall of Fame. ↑ "Joe Montana, QB". NFL.com. Retrieved 6 February 2013. ↑ Mike Olson. "Top 10 Quarterbacks of All Time". Men's Fitness. Retrieved 6 February 2013. This page was last changed on 11 September 2017, at 01:36.